Martha Stewart sets the stage for Beate’s Inspiration Challenge #33 this week. Aren’t these colors just yummy! I used three different Flourishes sets on my card. The leaves are from Flourishes “Autumn Flourishes” set. 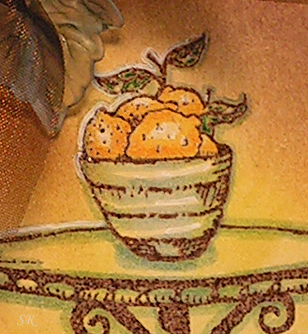 The table and bowl are from “Summer on the Patio”, and the sentiment is from “Figs and Pomegranates”. The ribbon is May Arts sheer 1″ width in chocolate. The leaves were stamped first using Garden Green and VersaMark on Barely Banana card stock. A VersaMarker was used to draw on the veins before clear embossing all the leaves. I then sponged and sponged using several different colors ranging from yellows to black at the bottom. The center was left a brighter yellow for the table and bowl. The bowl was stamped, clear embossed and masked. Then the table was stamped and clear embossed. The lemons were colored with SU! markers. A white gel pen was used for highlights. The sentiment was also embossed and popped up on dimensionals. Flourishes is kicking off the holiday season and everything at Flourishes is JustRite!! They want to make it easy for you to add to your wish list or buy for that special stamping buddy in your life. So starting December 1st, everything JustRite in the Flourishes store will be 25% off!! The Flourishes Design Team will be showing you lots of fun ways you can use these products, and we are giving away some goodies of our own!! Here are the blogs to check out this week for some yummy candy!! Your card is a gorgeous interpretation of the inspiration photo, Susan!! I’d just like to BE THERE!! This is such a neat interpretation of Beate’s inspiration. Lovely design and colors. Lovely card, Susan! Great job combining multiple stamp sets, too! Very nice interpretation of the inspiration photo. Your card is so beautiful, and it almost seems to glow! Gorgeous inspiration card, Susan!! Oh, Wow! This is absolutely gorgeous! Thank you so much for sharing! Very pretty Susan. I thought of this set first thing when I saw the piece on beates blog. Wonderful card and I so love the ribbon bow. You seriously BLOW ME AWAY everytime I open your blog. Wowzers! Beautiful! Such warmth and elegance! Fabulous colors, and fabulous distressing details. You’re a master! This is stunning, just amazing! I have an awrd for you on my blog! WOW – Susan – another stunning take on the BIC!!! I love this card – so inviting!!! WoW! WoW! WoW! This is just breath taking gorgeous, stunning, and fabulous! I just love your take on this challenge. Oooo pretty!!! Looks like a lot of work, but totally worth it! I like your new banner too! These colours are so warm and welcoming, beautiful. I love the card! Love the distressing and the bottom left hand corner is so unique. Just love it!!! Susan this is just gorgeous. This card is so beautiful! I just ordered the Flourishes November Bundle and with this kind of inspiration, I am so glad that I did! Wow, you did an amazing job capturing the essence of the inspiration. Couldn’t get any better than this! A fabulous challenge card Susan, love the picture! What a wonderful way to coordinate 3 different stamp sets! I love the still life look with the perfect sentiment. Simple and elegant and oh so beautiful! I love your new banner too! So perfect for your SCS nick! Gorgeous! You really have captured the look and feel of the challenge picture. TFS! WOW, Susan, this is just gorgeous! Gorgeous card! I just love the ambiance – so like the inspiration! Wow, wow, wow! This is gorgeous!!! 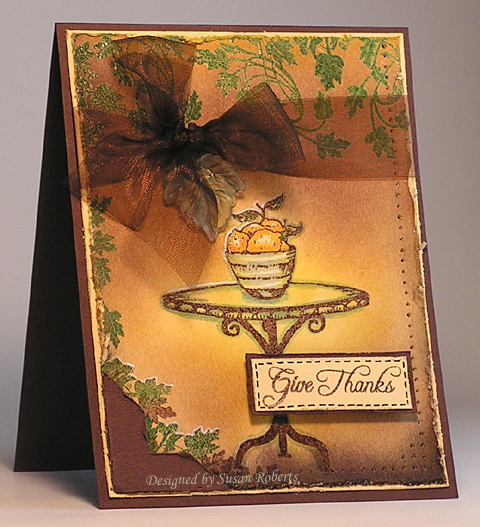 Absolutely gorgeous, Susan….I just love your take on the challenge with the warm colors and fabulous stamps!!! 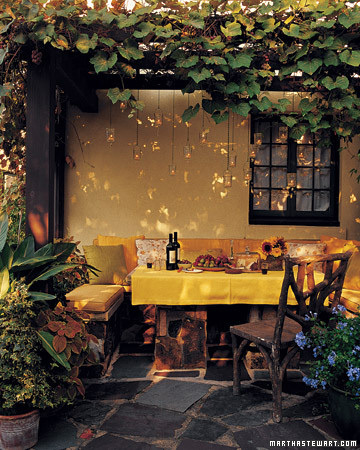 The table looks like it is in an old Tuscan courtyard…AWESOME!!! WOW Susan, this is just lovely!! Susan, I had to come by and let you know how absolutely gorgeous I think this card is!! I saw it on SCS and I just love it!! Beautiful details and coloring! Wow, wow, wow!! Susan this is drop dead gorgeous!!! You sure know how to capture the essence of a setting!! This is a real beauty Susan! The table looks like it has a spotlight on it making it glow!! It’s so warm and inviting!! Wow!! Holy Smokes! How did I miss this? Wow! Susan, this needs to be framed for sure. Susan, this is just beautiful! You have such a knack for these warm and wonderful cards. What a lovely piece this is! Your talents continue to amaze me, you have really “created” a beautiful picture. Susan, this is another totally breath-taking creatoin!!!! Oh my -the colors here just get me — everything is just PERFECT!!! Very elegant! The gold is so rich!! !